Sometimes you just have to be honest and admit that while an album is actually pretty good, it just really isn’t for you. Well with Brit indie rockers Mexicolas, that is exactly where I find myself. There’s no denying that the songs on the band’s second album ‘The Minerva Suite’ are catchy slabs of chart friendly rock and that this album will appeal to huge section of the people who put rock into the charts, but it just passes me by. I am a great believer that many great albums need numerous plays to really begin to reveal their true merits, however in the case of ‘The Minerva Suite’, I found the exact opposite to be true. The more I hear this disc, the less enthusiastic I become about it. Not because it is bad, but just because very little really happens and in this case familiarity breeds, well not contempt, but a little bit of boredom. 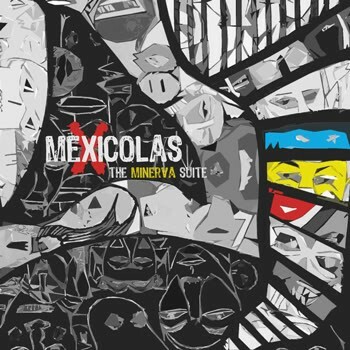 The reference points I wrote down as this album continued to spin were Razorlight, Snow Patrol, The Killers and Keane and while I find the music of those bands pleasant enough, that is also the word I would use to describe the Mexicolas - pleasant. In fact in places it is so “pleasant” that one of my ten year old twins asked me if Mitchell Musso (of Hannah Montana “fame”) was singing! That maybe does vocalist and multi-instrumentalist Jamie Evans a disservice, as there is much more rock back bone to this album than that comment would suggest. Evans actually handles vocals, guitars, bass, keyboards and percussion on all the songs (he even plays drums on one song – Steve Godfrey features on the tubs on all the other tracks) and considering that he also wrote all the songs on this album, there is no doubting that he is a talented guy. Personally I just wish he would really let go and rock out. In the same way that I feel when the likes of Snow Patrol come on the radio, I don’t instantly want to turn this music off and can see the appeal behind the gently rocking riffs and Evans’ calculated vocal delivery, but neither does it get me in any way excited. If you have a liking for the acts that I mentioned earlier in this review, then I think you will find a huge amount of ‘The Minerva Suite’ to be right up your street, and with their chart friendly vibe I really wouldn’t be surprised if Mexicolas are destined to make a real impact on the mainstream with this album.